Our family will visit the cemetery today. Someone from the American Legion will hand us poppies. The pastor will say a few words to those who’ve gathered. And then, we will bow our heads for a moment of silence. No one will speak. The air will fill with birdsong and the sound of flags flapping in the breeze. In that moment, I will pray as I always pray: for peace to rule in hearts everywhere. That’s how I’ve celebrated Memorial Day since I was a kid – with a few moments in a cemetery, observing and remembering. Maybe your Memorial Day looks similar to mine. Or maybe you’ll spend your day at a lake, or a park, or around the grill in your backyard. Wherever you may be today, may your day be filled with peace. And may you find a way to share a bit of your peace with the people around you. The world feels short on peace these days, doesn’t it? Mother Teresa once said, “If we have no peace, it is because we have forgotten that we belong to each other.” I worry, sometimes, that we forget that we really are in this together. It’s a noisy, hectic, I’m-right-you’re-wrong world out there. Today, I want to make a special effort to be less concerned with making a point, and more concerned with making some peace. or in a world groaning under its own weight . . .
if there be peace here, or if there be peace anywhere on earth, then let it begin with me. Here are six ways you can create peace in your life today. Click here, to read the rest of this post, over at incourage.me. I don’t want you to miss this event! 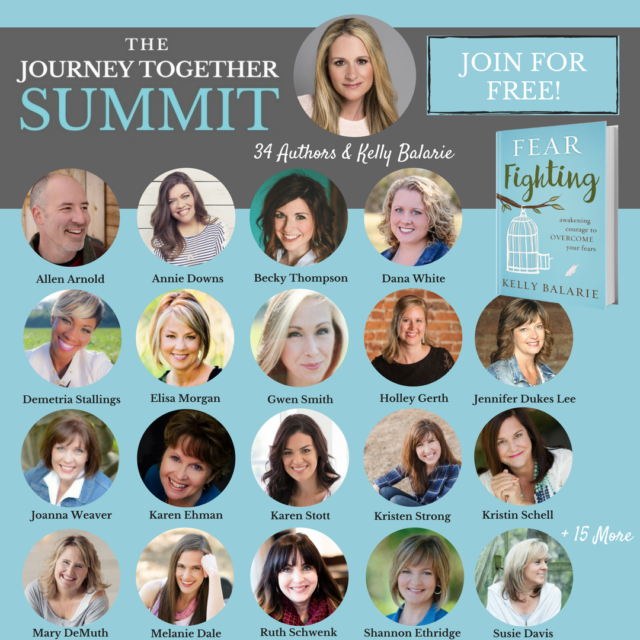 So, consider this your friendly reminder to sign up for The Journey Together Summit! This free virtual event goes live next week, June 5-8, but is available for viewing beyond these dates. 1 – Gain practical, relevant and biblical tips for stepping into peace, purpose, and passion. 2 – Identify your biggest hold-backs, so you can go-forth in freedom. 3 – Awaken your life purpose, instead of always wondering when it will show up. Because this event is FREE and VIRTUAL, we are bringing all the interviews directly to you!See the agenda by clicking here. What are you waiting for? Grab your FREE ticket today. And, if you can’t attend June 5-8, we have you covered. Get the All Access Pass and you’ll be able to watch the videos post-event. Hey Tell His Story crew! It is a joy to gather here every week with you. The linkup goes live each Tuesday at 4 p.m. (CT). If you would use the badge on your blog, found here, that would be great! And if you would visit at least one other blogger in the link-up and encourage them with a comment, that would be beautiful! Be sure to check the sidebar later. I’ll be featuring one of you over there! Our featured writer this week is Liz Giertz. I simply had to share her post with you, because you know how I feel about where we find our identity and our worth. Her words in this post remind me of my book Love Idol. “We cannot earn His grace by being good anymore than we can lose it by being bad. His grace comes to us as a gift through faith and there is no MESS greater than His grace.” Find Liz here. 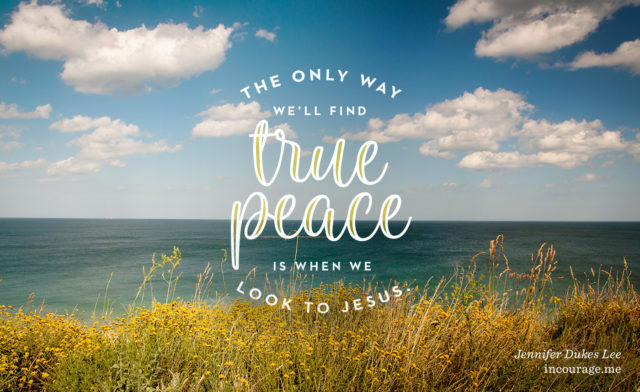 Amen – we all need a little bit more peace. Thanks Jennifer! I’m so thrilled you enjoyed the words from this post in my series on worth. God is teaching me so much! As a Veteran and the wife of a Soldier, I so appreciate your Memorial Day tribute traditions! Just joined the Summit – looking forward to some awesome inspiration! I’m looking forward to the summit next week, and hopefully meeting you at She Speaks this year! I love this! We could all use a lot more peace! Our world needs more peace! Great post! The summit looks amazing, can’t wait. “Let there be peace on earth, and let it begin with me.” Yes, ma’am. Every one of us needs to take responsibility for peace, understanding that each person’s attitudes and actions matter. Together we can change the world! Thanks so much for hosting this linkup. I’m tickled to be joining you again! Late to the party and wondering what happened to Tuesday! Thanks for the reassurance that peace is an option — and for the details about the summit!